My 2017 started with preaching! I delivered this sermon on 1/1/17 to the Shenandoah United Methodist Charge (Fields UMC and Christ UMC) at the 9:30 AM and 11 AM services respectively, where I also serve as secretary. Epiphanies are manifestations, striking appearances which appear to us quietly or crash into us in the midst of ordinary life. They are minor and necessary disturbances. 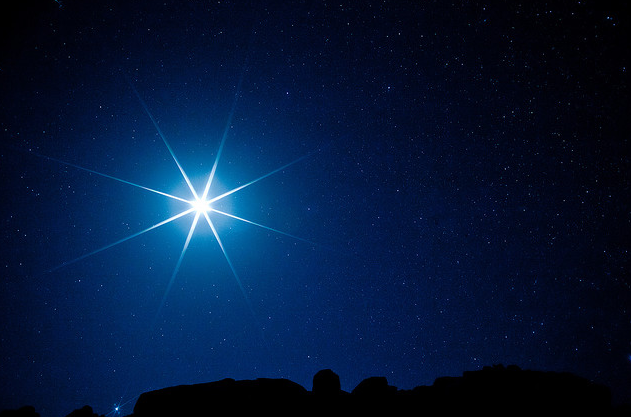 That’s why today is known as “Epiphany Sunday,” because we remember the striking appearance of the star which led the wise men to Jesus. This is the day we remember how the foreigners, not the Jews of Jesus’ time, discovered the epiphany of the word of God made flesh. Today is also the first day of this new year, 2017. The last year has been, for many, tumultuous and exhausting, filled with loss and pain. This day, we hope to begin a new year with clean slates and hearts full of hope. No matter what the previous year was like, we hope each new year will be better than the last. So on the same day, we celebrate both the joy of a group of outsiders finding Jesus and the beginning of a new year after one of much division and fear. We are both celebrating and searching for Epiphany. This is very much like my own faith journey. I have encountered beautiful manifestations of Christ and sought his presence simultaneously. I grew up in a Pentecostal church and had the love and support of my small group, youth pastor, and best friend. Together, they helped me find God in ways I didn’t expect. In many ways, they were the stars that guided me at this point in my faith journey. One of the ways they significantly directed me was in my decision to attend an event called Winterfest when I was 15. Winterfest was the ultimate Pentecostal revival and unofficial initiation for the high school members of my youth group. I remember seeing videos from the previous Winterfests, showcasing fun days spent at Pigeon Forge adventure park and passionate nights being “slain in the Spirit.” Despite my initial discomfort with such public displays of spiritual affection, my curiosity got the better of me, and I signed up my freshman year. The weekend culminated in an intense sermon given by a fiery pastor, his powerful message amplified by four JumboTron screens. I knew the man had set the stage for a true Pentecostal conversion and felt the passionate emotions rising within me. But the Pentecostal switch didn’t flip in me. Despite the passion and conviction I felt, the “real” experience wasn’t happening. I was on the outside looking in at this ecstatic group as the Spirit rained down on them, thinking God had abandoned me. I was lonely in this crowded arena, so I sulked away to an emptier part of the stadium and made my own solo efforts of prayer, petition, and grumbling to God. I begged for the love and presence of God that supposedly never failed, left, or gave up on me. Eventually I did find myself on my knees and crying, but instead of tears of spiritual ecstasy, mine were tears of abandonment and loneliness. In my desperation, my high school small group gathered around me. I felt their hands upon me, heard their whispered prayers of encouragement and love, just as I had during our weekly meetings. I found myself surrounded by the ones who knew my own insecurities and crushing anxieties. When I opened my eyes and saw them around me, I heard the words that began to heal my wounds: You are not alone. I am here. I will always be here. These were the words of God, who I so desperately wanted to meet but feared. And he quietly met me where I was in my stadium section, surrounded by a group of people who loved me. This experience of epiphany first brought me to God. This epiphany manifested in a quiet moment made so powerful by God’s love, and my small group friends helped make it happen. I experienced another, but more drawn out and, on the surface, less joyful epiphany during my senior year at Bridgewater College. I was taking a Senior Seminar class during Fall Semester, and our topic was Clashes of Culture. To me, it seemed as if this class was tailor made to rip the rug of my faith from under my feet, turning everything which I held dear as the bedrock of my life into out-dated rags fit for no one. I had so many questions that I was afraid to ask, not because I thought they would be brushed aside, but because I feared cookie-cutter answers and Band-Aids over wounds that needed further medical treatment, maybe even some surgery. I feared asking questions because I feared being treated like a project, and I didn’t want people to pray that I would have more faith to overcome my doubt so I could conform once again to their proper mold. The mold that had given me life and purpose left me feeling claustrophobic and fake. I knew if I stayed within this mold, if my questions remained in the dark of my fear and never saw the light of my confession, my faith would die. Then I found a counselor at school named Randy. He wasn’t threatened by my questions, and he prayed with me at the end of each session. I remember talking to him about my doubts, and we started talking about Thomas, the disciple. I had always thought Thomas was a bad example for “good Christian people,” and I worried because I found myself relating a lot to him, but Randy challenged that notion. To Randy, Thomas didn’t doubt because he cared too little about Jesus and the Gospel; he doubted because he cared so much. He doubted because he took Jesus’ life, message, and death seriously, and if people were going around saying that Jesus was back, Thomas wanted to make sure Jesus’ message remained true and didn’t become another myth or tall tale. Thomas cared SO much, not so little, about the implications of Jesus’ return that he knew better than to take them lightly, and he expressed the importance of his faith in Jesus in doubting. In acknowledging my doubts, I fond life. I refused to let my faith die. It became alive and less stagnant, a living, breathing organism instead of a frigid set of rules and beliefs. So as I started wrestling with my questions, I realized I was finding God in service to others. I found God in the children who came to the mentoring program I coordinated, the ones deemed “at-risk,” who came from families where English wasn’t the first language or from single-parent or low income families. I met refugees and homeless people and shared stories with them. I went to seminary and befriended professors and students alike who had steadfast faith and still asked a lot of honest questions. I found out God loved all of these people, and God gave me a calling to be their pastor. Both of my Epiphany moments taught me about Emmanuel, God with us, and both have been significant to my faith journey. In one, God reminded me of God’s presence with and love for me, and in the other, God reminded me of God’s presence with and love for others, especially the ones I feared and disliked. In one, God began my salvation journey, and in another, God began calling me to ministry, both of which continue to unfold. The two are not exclusive. So as we begin a new year, and as we remember the Epiphany, of the wise men finally finding Jesus and giving him their gifts to commemorate his status as once and future king of Creation, how will we take on new chances to serve and worship God? As is the case with my story, all epiphanies are powerful, but not all of them are pleasant. They can be gentle, and they can be tough. They can lift us up, and they can humble us. They can comfort us, and they can challenge the things we hold most dear and certain. But they are always there, and God is always revealing them to us. How will we become more aware of them this year, by God’s grace?